Solvina International is a Swedish engineering company that provides testing services for improved productivity, security and stability of nuclear, conventional and cogeneration power plants. The company has extensive experience in the testing of power plants and process industries. We reach optimum performance by combining testing with advanced theoretical analysis. Solvina provides test programmes based on grid codes for new or modernised plants, which are to be connected to the grid. We conduct the tests to verify grid code compliance. Our test programmes can be tailored to meet specific requirements. Our experts plan and carry out the tests with plant owners, OEMs and grid operators. Our test methodology, using the real-time simulator SolvSim® Power Station, enables safe island and in-house operation testing and development. We optimise the control modes for optimum performance and tune limiters and protections, without sacrificing the protective function. 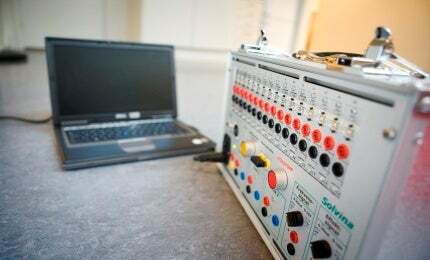 A hardware-in-the-loop simulator, connected to the governor control, is used for tuning frequency responses in normal and island operations. Solvina develops and improves steam system control by coordinating the control for boilers, bypass valves, turbines and steam accumulators. Our methods ensure the best possible process control for all the critical operating conditions. The automatic voltage regulator (AVR) of generators has several control modes and modules for limitations and stabilisation. Solvina performs PSS tuning and AVR tuning to meet grid code requirements and local requirements. Dynamic simulation of the surrounding power system is performed to get the best possible result. The settings are followed up in the commissioning phase. Solvina has expertise in power system analysis and studies. Our customers are utilities, industrial facilities, wind farm owners and suppliers of power system products. The Solvina power system study group focuses on improvements of existing systems and power plants, as well as studies for planning and procurement of new equipment. Our engineers have in-depth knowledge in advanced power system simulation and calculation tools, such as DIgSILENT PowerFactory, EMTDC / PSCAD, PSS/E, Dymola, Matlab and SimPow. Powerful analysis tools in combination with knowledge and experience of field measurements is a key factor for successful projects, covering all phases, from initial studies to the final field verifications. Advanced Course in Power System Stability and Control, Dubai. Solvina International introduces the advanced and comprehensive course in power system stability and control with Dr. Prabha Kundur, in Dubai April 3-7. SIMPOW® is a highly integrated software for simulation of power systems. One of the major concerns when running a power producing unit in island operation is the ability to control frequency. Solvina International is now firmly established in India. Solvina be hosting a course, which aims to introduce the subject of power system protection, to enable understanding of applying and setting protective relays from 5 to 8 October at the Lilla Bommens Conference Center, located in central Gothenburg. Solvina International has been awarded an important pilot project to carry out testing, evaluation and improvement to the primary response and island operation capability of power plants in India. Solvina will be at Power-Gen Asia in Kuala Lumpur on 10-12 September and will talking to visitors at IPPF booth 2240.